The book is now available from this site! It is also available at the major online bookstores and in many local bookstores as well. One advantage of purchasing the book here, though, is that Jeff will be happy to sign your copy and write a short note. 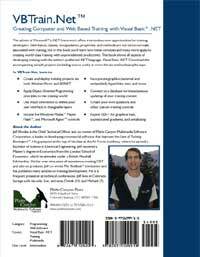 The advent of Microsoft®'s .NET framework offers tremendous new opportunities for training developers. Inheritance, classes, encapsulation, properties, and methods are not terms normally associated with training, but in this book you'll learn how these concepts and many more apply to creating world-class training with unprecedented productivity. This book shows all aspects of developing training with the author's preferred .NET language, Visual Basic .NET. Jeff Rhodes is the Chief Technical Officer and co-owner of Platte Canyon Multimedia Software Corporation, a leader in developing commercial software that Improves the Lives of Training Developers™. He graduated at the top of his class at the Air Force Academy, where he earned a Bachelor of Science in Electrical Engineering. Jeff received a Master’s degree in Economics from the London School of Economics, which he attended under a British Marshall Scholarship. He has over nine years of experience creating CBT and add-on products. 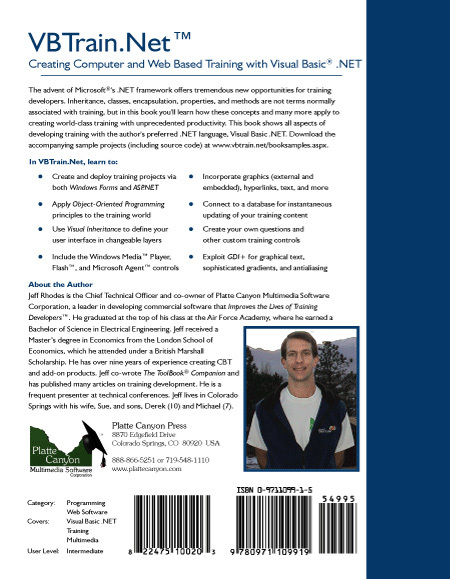 Jeff co-wrote The ToolBook® Companion and has published many articles on training development. He is a frequent presenter at technical conferences. Jeff lives in Colorado Springs with his wife, Sue, and sons, Derek and Michael. I want to stress again how much I'm enjoying your book. Here's why: I've bought a ton of .Net books over the last two years. First I did ASP.Net work, and now I'm moving into WinForms. Most of the books look at .Net from a feature point of view--they cover all basics, presenting the CLR, controls, data access, error handling, deployment, etc. But they provide little, if any, real-world information about taking all these features and creating an application. Your book, on the other hand, takes the opposite approach (as you know! ), and provides a quick look at the .Net architecture, but then moves straight into developing an app., teaching more about .Net along the way. I wish there were more books like this! 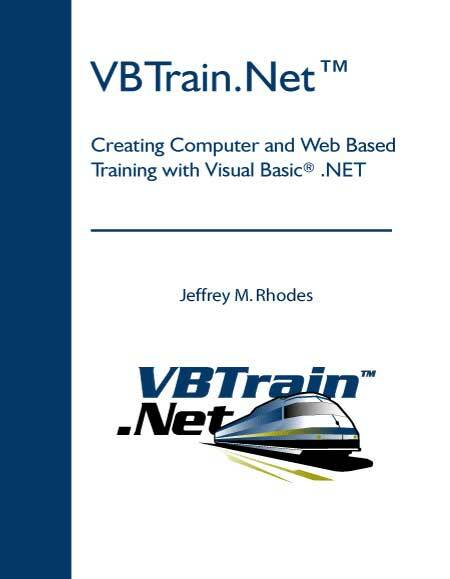 I purchased your book VBTrain.Net last week. I am very impressed after going through it this week. I will be passing and recommending your book to others. You have a great, relaxed writing style. Just wanted to thank you again for the book!! I have already been reading it. You have a very effective style for presenting concepts, and your writing is very readable and easy to follow. In my experience, that is rarely found in technical books. My congratulation on an excellent book!! I very much enjoyed your style of writing and found it a very good introduction (with enough depth to satisfy most advanced-but-new-to-VB readers while being clear enough for those with less experience). Your enthusiasm for the product (and creating training materials) is clear throughout and this is always important in getting this type of material across to your readership. Put in brief, in modern British English, "Nice one mate!"